Launched 1 September 2016, our app is the world's first providing the approved ADMIRALTY paper chart corrections, including tracings, notice and correction blocks, via an electronic tablet. Developed by mariners for mariners, we reviewed the many other chart correction software on the market and determined most are swamped with features which the average mariner simply doesn't want or need. Their overcomplicated menu structures and inability to easily find the relevant information mean the person designated maintenance of the chart outfit can waste much time when all they want to do is download the corrections for the forthcoming passage, apply them and execute the passage plan. 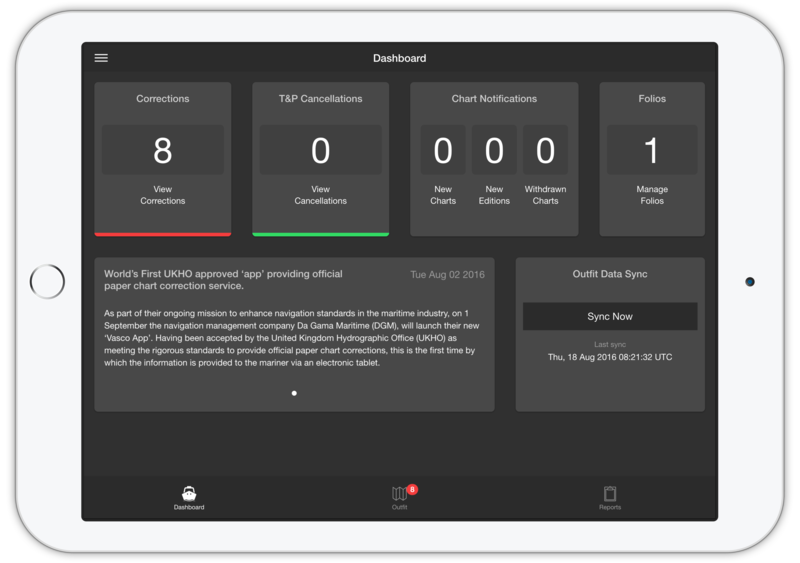 Our app has been designed specifically to make it as easy and intuitive as possible for the mariner so they spend more time looking out of the window when on watch or able to catch up with sleep when off. The app was deliberately created due to the lack of software compatible for the Mac operating system and therefore this will run on any iOS or Android tablet and should you lose or damage that equipment, simply download the app to another, log in with your main user account and carry on from the last sync which was conducted without having to re-load your outfit manually again. Build their outfit from the standard UKHO catalogue of folios and store them in the same folio structure or a completely customable format specific to that vessel. As another industry first, log in duplicate charts, useful when two or more of the same are held on board or perfect for training schools and academies with multiple copies of the same. Having entered your outfit, quickly set the latest Notice to Mariner and apply it to one, all or as many of the charts as necessary. Determine which corrections to download to save time and communication costs. Generate additional users on board to maintain full accountability of the chart correction trail. View or print audit compliant reports detailing the full status of the outfit, corrections, T's & P's and other relevant information. 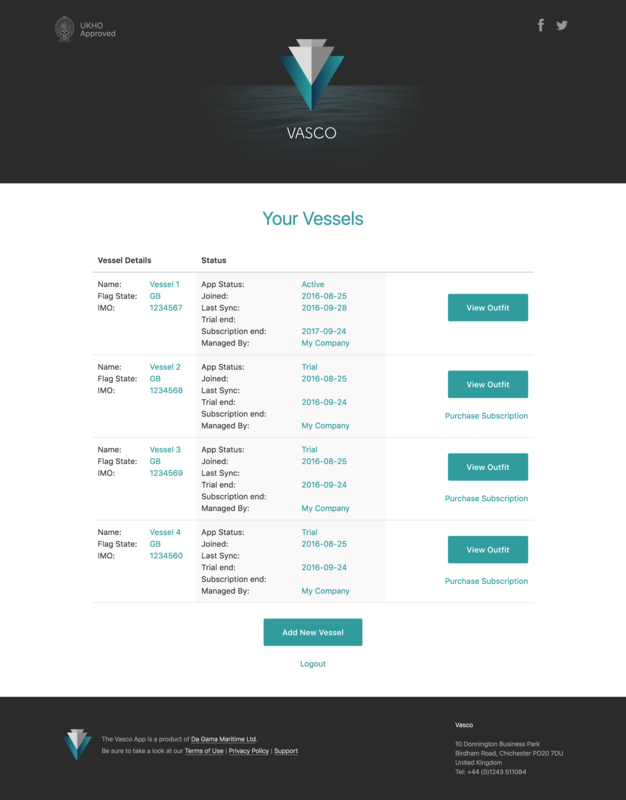 As an additional advantage, we've developed the app with the added convenience which allows management companies to log in remotely via the website to the outfit of each of their vessels to determine its status. This useful feature not only allows the superintendent to keep an eye on the chart status but also prepare for any forthcoming audit. Furthermore, if charts are kept in storage at the management company where a correcting service is in place, the corrector can similarly log into the vessel outfit and 'apply' the corrections as the charts are returned on board which again saves time for the bridge team. We're also delighted to report that from 4 January 2017, the app became officially recognised by the Maritime and Coastguard Agency (MCA) as a means of updating and recording the update status of a paper chart outfit. A copy of their letter can be viewed at this link. For further information, please visit the dedicated website here, register for an account and try the service for free for 30 days. If you're a management company and want to discuss fleet discounts, then please contact us.